A conversation with Luca Pedol of Nauta Yachts this morning confirms that the 24m sailing yacht Capricorno has now been signed as a central agency for sale. Built as a high-performance yacht by McConaghy in 1995 to a Reichel Pugh design, she went on to win the Sydney-Hobart and Cape Town-Rio races and in 2005 the owner converted her into the ultimate cruiser/racer with new decks and carbon mast plus new interiors fitted out by Indiana Yachting in Italy. She now comfortably accommodates six guests in three cabins plus one crew cabin. The 2007 winner and current record holder of the ARC, she also explored remote areas around the world such as Patagonia, Cape Horn, Polynesia and Eastern Australia. 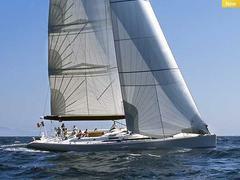 Now back in the Mediterranean, she's on the market asking €1.9 million.